The tropical regions of the Earth are between the Tropic of Cancer and the Tropic of Capricorn in a band of straddling the equator. Forests in the tropical regions can be evergreen or deciduous. In the evergreen tropical forests, a range exists based on precipitation. Tropical rainforests receive enormous amounts of rain all year. Drier tropical evergreen forests receive seasonal rain. The types of animals in both kinds of forests vary, but both boast rich species diversity. Tropical rainforests alone house over half the Earth’s animal species. Tropical evergreen forests can be moist, in the case of rainforests, or drier with seasonal rain. Both types of tropical evergreen forests have many species of animals. Rainforest animals include monkeys, parrots, smaller animals and large numbers of insects. Drier tropical evergreen forests host larger animals such as Asian elephants, tigers, and rhinoceros as well as numerous birds and small animals. Tropical rainforests receive incredible amounts of rain each year, and thanks to the heat and moisture, layers of vegetation exist. Animals evolved to thrive among each tree canopy layer. Monkeys such as the upper canopy Spider Monkey evolved with long arms and prehensile tails that grasp tree limbs. This allows such primates to move freely through the trees. 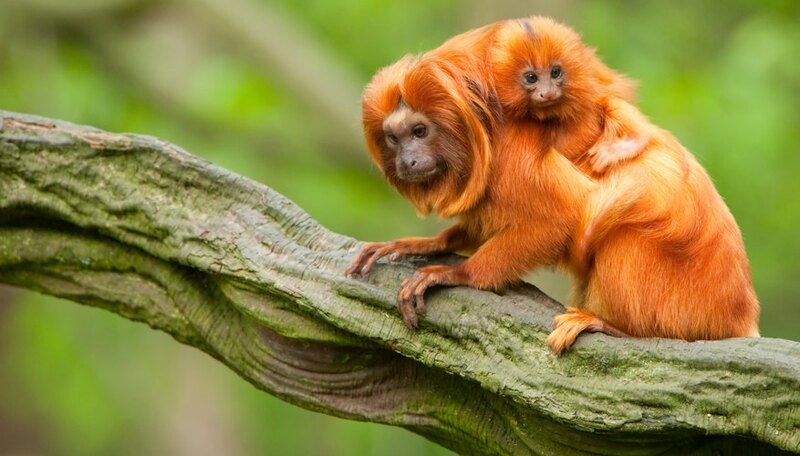 Notable small primate species of the rainforests also include langurs, capuchin monkeys, howler monkeys, gibbons and leaf monkeys. Great ape species include gorillas and orangutans. Other mammals in the rainforest include sloths, coati, rodents, bats, peccaries and flying squirrels. Cats such as jaguars, ocelots, civets and jaguarondi also call the rainforest home. Bird species favor bright plumage and piercing calls in the shaded, dense canopy. The scarlet macaw and the toucan represent such vibrant tropical birds. Other birds include Amazon parrots, crows, pheasants and grosbeaks, among many other species. Numerous reptiles from lizards to snakes reside in the rainforest. Amphibians, some brightly marked as a warning to potential predators, live in abundance. The incredible insect variety in the rainforest includes ants in large colonies, termites, katydids, walking sticks, butterflies, wasps, spiders, beetles and cicadas. Not all tropical evergreen forests receive as much rain as a rainforest. In these drier tropical evergreen forests, a different cohort of species exists. These biomes tend to host much larger vertebrate animals. For example, in the Southeastern Indochina Dry Evergreen Forests, the large animals are Asian elephants, Malayan sun bear, Javan rhinoceros, banteng, gaur, kudu, duiker and various species of deer. Gangetic river dolphins reside within the boundaries of the Barak Valley region. Large cats roam this ecosystem, such as the eponymous tiger and its smallest endangered subspecies, the Sumatra tiger, clouded leopard and common leopard. The tiger is a flagship species for ecosystem health. Smaller mammals of drier tropical evergreen forests include mice, macaques, gibbons, Phayre’s langur, Chinese pangolin, bushpig, wild dog, boar, jackals, civets, fruit bats, flying foxes, squirrels and mongoose. Bird species of this ecosystem include guineafowl, cuckoo, turaco, bulbuls, myna, crows, forest weaver, parakeets, pigeons, barbets and orioles, to name a few. Drier tropical evergreen forests also host many species of reptiles, amphibians and insects. Animals within these regions face numerous threats to their long-term survival. The encroachment of human settlements and the development of roads fragment the forests. Logging and firewood collection lead to habitat loss and fragmentation. Farming practices create canopy loss and habitat loss as well. Illegal hunting and poaching contribute to species decline. With conservation, education and more sustainable strategies to coexist with animals, there remains hope that people can work to protect tropical evergreen forests and all the species within them. Dianne, J.. "Animals Found in the Tropical Evergreen Forest." Sciencing, https://sciencing.com/animals-found-tropical-evergreen-forest-7388926.html. 13 April 2018.